Today’s post comes from a small book called, “On This Day” by Robert J. Morgan. Inside its pages are 365 stories about saints, martyrs, and heroes of the church throughout history. I found today’s to be a good one and I hope you do too! 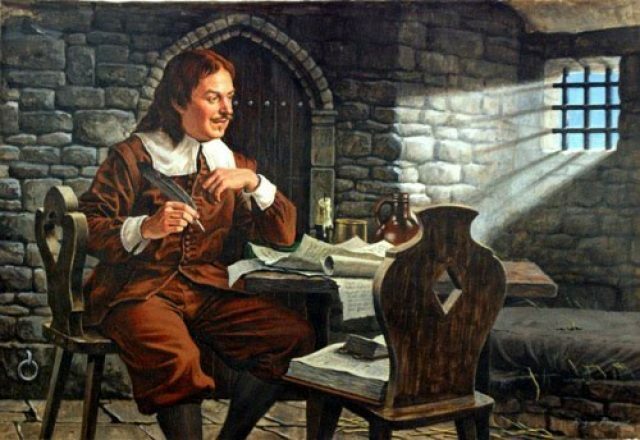 If The Imitation of Christ has a rival in sales, it is The Pilgrim’s Progress, written by John Bunyan. On November 12, 1660, Bunyan left home to conduct a small worship service in a friend’s house. Earlier that year King Charles II of England, Bible clutched to his breast, had returned from exile to restore the monarchy and to return the Church of England to its position of authority. All non-Anglican houses of worship were closed, making Bunyan’s preaching of the gospel now treasonous. Arriving at the farmhouse, Bunyan learned that a warrant had been issued for his arrest. His friends urged flight. “No!” he replied. “I will not stir neither have the meeting dismissed. Let us not be daunted. To preach God’s Word is so good a work that we shall be well rewarded if we suffer for that.” The service was soon disrupted by the local constable, and Bunyan managed only a few parting words before being arrested. He spent the next 12 years imprisoned in Bedford, England, during which time his family suffered and his beloved blind daughter, Mary, passed away. Bunyan supported his family by making laces in prison; but shortly he discovered a hidden gift – the ability to write. His fame as an imprisoned writer fueled sales of his books, and he eventually wrote 60 volumes, on for every year he lived. His most famous work, written during the final phase of incarceration, is Pilgrim’s Progress. It sold 100,000 copies during Bunyan’s lifetime and millions since. It joins The Imitation of Christ in being publishing history’s top bestseller, apart from Scripture.